They’ve battled overweight, even underweight, and believe their experiences have enlightened them, shaping their counseling style and understanding of the core principles of weight maintenance and inspiring the empathy needed to best guide their patients. Read their stories. With the United States in the midst of a well-known weight dilemma, it’s no surprise that plenty of RDs have personally battled with obesity, overweight, and even underweight issues. 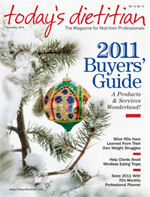 From lessons learned from their own weight loss to the ways in which these experiences have shaped how they counsel clients, RDs speak out about what their personal—and sometimes dysfunctional—relationships with food have taught them about weight control and how these particular struggles have helped them counsel clients so desperately wanting to conquer the same dietary demons. If you ask Adam Burda, MS, RD, LD, how he lost 100 lbs, he’ll tell you the same thing he tells his patients: Weight loss isn’t about a particular miracle diet; it’s about finding what works for each individual’s lifestyle. Burda, who now works in an acute care setting in West Virginia, often shares his personal story with patients, and he says whenever someone learns of what a remarkable weight loss he has maintained, they always ask about the diet that got him there. But instead of namedropping the latest fad diet or weight-loss research, his recommendations come from what he has experienced. “I tell them I’m not going to put them on a diet; I’m going to put them on a lifestyle change,” he says. “Because in order for [patients] to maintain this weight loss, they can’t just change their eating. They have to change what they’re doing daily,” as far as physical activity, the individuals they’re surrounding themselves with, dietary habits, etc. For Carol Banister, RD/LD, MS, CDE, who has been in private practice for 30 years, the weight struggles started in her freshman year of high school. While she wasn’t severely overweight by any means, she didn’t appreciate the “natural filling out” she experienced at this time, and thus she tried dieting. “I thought it was weight I didn’t want, so I started dieting, trying crazy things. I would take lettuce sandwiches to school or I would skip a meal or just eat very, very lightly,” she explains. At high school graduation, she estimates she was roughly 10 to 15 lbs above her ideal weight, another testament to the unhealthful effects of on-again, off-again dieting practices. Banister’s dieting antics continued through her college years, and by the time she applied to enter the dietetics program, she was put on probation due to her weight. “Now, this was in 1971, so things have changed. But I was admitted on probation because of my weight, so whenever I would go to my advisor’s office for a question, she’d put me on the scale,” Banister remembers of the bathroom scale kept under her advisor’s desk for such occasions and the unpleasantness and apprehension it caused her. The day Banister was told her weight was not a deciding factor in her schooling proved to be a huge turnaround for her “because at that point I can remember to this day walking out of that office and [saying to myself], ‘I own this. This is my choice, this is my decision, and I’m going to have to decide where I go from here,’” she remembers. With the tools she had gained through her schooling and with the decision that she made to take ownership of her health, she started to lose weight on her terms. “I spent probably two years losing 50 to 60 lbs, so it was not an easy road. I had a lot of talks with myself. I would lose some weight and stay there—I never went back and forth—but I eventually got the weight off and really realized that that’s where I wanted to stay,” she explains, noting that she hasn’t had issues with her weight since she took it off back in college. High school also brought weight struggles for Jennifer E. Seyler, MS, RD, CPT, nutrition manager for the public relations agency Current Lifestyle Marketing. “That is when my interest in nutrition started and I became more involved in understanding nutrition—mainly calories and fat grams. I created and printed Excel sheets that allowed me to keep track of my daily consumption, trying to stay at 1,200 kcal per day with only 30% of my calories coming from fat,” she explains. Thinking back, she remembers the agony of staring at the three tiny pancakes she would allow herself for breakfast, wishing she could eat more. “As you can imagine, the desire to eat continued to grow as the weeks went on and the restriction stayed the same,” she says. Seyler notes that she doesn’t even remember if that daily restriction led to any weight loss because restriction always led to an eventual eating to excess. “All I can remember is when I snapped and started eating from a gallon ice cream tub my family had, and all the while I heated a 12-inch frozen pizza with the intention to consume the entire thing. My family just stared and calmly asked me, ‘What are you doing?’ I frantically responded with, ‘I am so hungry,’” she says. From this experience, Seyler learned that such severe calorie restriction would never lead to any sustained long-term weight-loss success for her “because I would eventually snap again.” Yet it helped mold her as a dietitian, and she has since used her experiences to help clients in similar circumstances. “Before I became aware of or was more in tune with my own behaviors, I used to think that it was all about willpower. I still think willpower is needed to help lose weight, but there are many more emotional and behavioral aspects to it,” she says of what she learned from her own weight-loss journey. Allison Parker, MS, RD, has a more multifaceted relationship with weight, and her current counseling style has been molded by both overweight and underweight experiences from her past. “My first recollection that I was heavier than my peers was in third-grade gym class. I’m pretty sure they don’t do this anymore, but they weighed us in front of the entire class, calling out each person’s weight and writing it down. I detested gym class. When it was my turn, I found out that I was the heaviest girl in the class. To this day, I hate getting weighed in public, even though I’m now at a healthy weight for my height and quite secure with my self-image,” she explains. Partly because of a doctor’s recommendation that exercise would help an injury heal faster, Parker decided to get involved with team sports early in high school and dropped to a healthy weight, becoming a star player on her school’s field hockey team. Yet a healthy weight did not make for a healthy relationship with weight just yet. “Realizing that physical activity was the key ingredient to weight loss, along with a diet that was low in fat and high in fiber, and feeling the pressure of graduating [high school], getting a scholarship for field hockey, and the impending separation from everything that was familiar, I started to work out more and eat less since it was something I could control,” she says, which started an unhealthy trend toward underweight. Parker says by the time she got to college, looking at herself in the mirror every day was a struggle. With the myriad stressors of college life piling on, she became obsessed with the one thing she could control: “what and when I ate and how much I worked out.” In addition to two daily workouts for field hockey, she would add in an extra cardio workout and found her eating occasions to be more erratic and less frequent. “By the end of my freshman year, I was 95 lbs, appeared wasted, had heart palpitations, was constantly cold and exhausted, and dealing with lanugo. For me, the worst thing was being told I could not return to the field hockey team until I was in better shape because in my mind I didn’t have a problem,” she says. After returning home to friends and family shocked by the sight of her skeletonlike frame, Parker somehow had the sense to snap herself back into more healthful ways of eating. “I made a promise to myself that I would learn how to have a normal relationship with food. It took a while, but I did overcome it. With the help of a dietitian, a school counselor, and a nurse practitioner, I gained weight and by senior year of college was much happier and healthier,” she explains. What did she learn from experiences that left her scale tilting too far in two different, but both unhealthful, directions? “I’m happy to say that today, I’m very comfortable with who I am. I love food and running and have found a healthy balance of both. … I can easily relate to both sides of the spectrum—from struggling with being overweight to struggling with being underweight. I know what it’s like to constantly be thinking about food and counting calories or wondering when you might get some free time so you can go work off that bagel you just ate,” she says. It’s all about balance, she says, a healthy balance that’s unique to each individual but that exists for everyone. Burda notes that opening up about his relationship with food not only puts him on a level playing field with patients but allows for a hope that they, too, can accomplish the seemingly impossible. “I have 100% faith in everybody that I go and speak with because they’re looking for any glimmer of hope, and sometimes I’m the last person they come to. I always tell them that they took the first step by coming and talking to me. I tell them to just ‘believe in yourself’ and that ‘we’re not going to ask anything of you that you can’t do.’” Because if he can do it, why can’t his patients? Burda says this tactic has worked for many patients who had given up on losing weight before hearing his story. Neva Cochran, MS, RD, LD, was one of the few overweight kids in elementary school before a childhood obesity problem existed. At nearly 20% above her healthy weight in fifth grade, she lost the excess weight under her pediatrician’s direction. Since then she has put on and taken off gradual, modest weight gains of 20 to 25 pounds every five to 10 years but has never been outside her normal body mass index range since childhood. Yet Cochran says her personal accomplishments in taking off the weight can serve as testaments to clients seeking to do the same. “I am sympathetic to clients because I understand that losing, and especially maintaining, weight is not easy. It takes constant vigilance and a commitment to a total lifestyle change. But I am an example that it can be done,” she says. Valerie Reynolds, MS, RD, CSNC, LDN, a clinical dietitian at the University of Chicago Medical Center, believes that having conquered her own weight issues helps foster a feeling of trust with patients, which also helps to give them hope in their own weight-loss journey. “I also think it’s a motivator to patients if they see someone else could do it, they can do it, too. Because otherwise it doesn’t matter how much you know and what you say to them. If they don’t trust you, you’re not going to have an impact on them,” she says. Bill Bradley, RD, writer for the blog Confessions of an Overweight Dietitian—along with every other RD interviewed for this article—believes a personal battle with weight control has given him the gift of empathy, which he can then give to clients. “My personal experiences have given me a great deal of empathy. If you haven’t experienced what it is like to be overweight, the difficulties around that, then it is more difficult to really understand what is going on,” says Bradley. “I’m not saying it is impossible. I am just saying I know the emotional and physical toll of having too much fat on the body. I saw it with my mom, who was morbidly obese, and I have seen it in myself a few times in my life. When I can tell clients that I have been there, that I know exactly where they are coming from, it puts them at ease and it helps them to open up about what is really going on,” he says. Seyler says her personal experiences have not only helped her to be more sympathetic but also have helped her recognize the right time to push clients, because she’s been there, too.